Wood ceiling beams are a quick way to add that extra element of style to any space. They look great and help to break up the space and reduce echo. Not to mention, they are the perfect place to hang light fixtures or a pot hanger for a modern, classy look, stained and well polished beams look amazing. For the rough chic or rustic country look, old railroad beams make beautiful, interesting ceiling beams. Don’t worry about sanding or staining them, celebrate their rustic beauty. The options for your walls are limitless. We recommend if if you want other parts of your space to stand out, such as your cupboards and cabinets, go with a simple white wall. White walls appear clean and fresh and allow the space to feel more comfortable. If you do want color, try an accent wall to combine your kitchen and dining area, rather than painting all the walls. Wallpaper is always a classic option and can help get that country feel you’re going for, just be careful not to select a pattern that is overwhelming. Instead of a backsplash in the kitchen, you can try ceramic tiles for a more classic, rustic look. They are also easy to clean and relatively inexpensive. We absolutely love the classic modern blend of using brushed copper or galvanized metal for lighting accents. It is simple and captured the farmhouse feel while allowing the space to also look modern, the epitome of rough chic. To create a unique rustic look that dims the light for a more country comfortable feel, try leather lamspades. Stretched and bleached hides allow light to spill through perfectly. Never underestimate the importance of cabinets! Your kitchen cupboards or cabinets take up most of the wall space and are the most visible part of your kitchen. We love the current trends in rough chic cabinetry that perfectly blends classic and modern. Real, all hardwood cabinets are functional and beautiful. 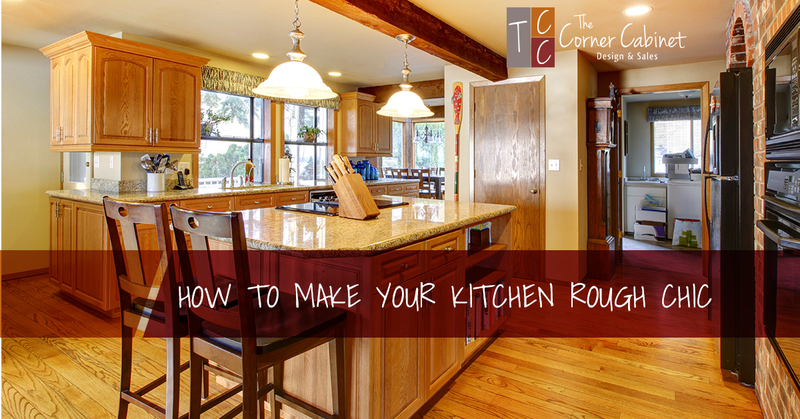 There are so many beautifully rustic options for countertops. 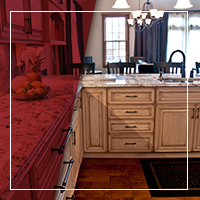 A current popular trend is marble slabs atop wooden cabinets. You can also chose wooden countertops as long as they are sanded and finished well. They should have a thick glaze that prevents food from soaking into them. We like the combination of a natural barn wood island topped with a modern polished ceramic countertop. If you are looking into a kitchen remodel for your home and love the rough chic look, the design team at Corner Cabinets can create your beautiful custom kitchen, and install it! Call us to schedule an obligation-free consultation today for ideas and quotes to match your budget.